Linesman/Referee. Born in Winnipeg. Morley Meyers started a 35 year officiating career at age 14 in minor hockey in his hometown and, in 1958-59, became a linesmen in the MJHL. 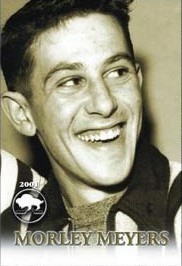 He also worked in the 1959 Memorial Cup final. From 1960 to 1966, he officiated junior, intermediate and senior hockey in the province. He refereed in the IHL (1962-63), and was a linesman in the WHA (1972-76). Morley Meyers also officiated U.S. college games for 20 years.